God wants us to be close to Him all the time. One of many ways He wants to give His grace to us are the Sacraments of the Holy Catholic Church. We need to be properly prepared to receive Sacraments fruitfully. That’s why our Parish provides several Sacramental programs. 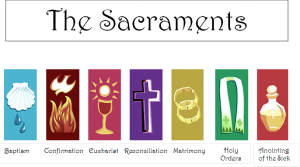 Please, find below a list of the programs which will help you to meet God in different Sacraments.